One of the reasons I started this blog was to show that there is more to Syrian food than Grilled meat and Mezze. So my main focus was to move away from the stereotypes and write about delicious, but little known outside a Syrian household, dishes. Nevertheless, Mezze is an integral part of Syrian cuisine and it deserves a place on my blog. I am going to write a series of posts on different Mezze dishes. I set my self the silly target of one hundred and one recipes. I am not sure why 101 but it sounds good first of all. Secondly, I am sure I read somewhere that there is more than 400 types of Mezze. True or not, I think I should manage a quarter of that number. Mezze (Maza as pronounced in Syria) strictly speaking means any food served next to alcohol, being some nuts in a bowl or something way more sophisticated. Usually small portions in small dishes. The term we use for all these small dishes when served next to BBQ or before your main is "Muqabelat". Literally means appetisers. To start my series I chose my absolute favourite and the least known of all Mezze dishes: Keshkeh Khadra. Keshkeh (or Kishk, Kishkah, ... etc) is a fermented mixture of grain and yogurt. The mixture is then dried and ground to a flour like powder. There is several ways you can use dry keshkeh. My favourite is a nice warming bowl of soup in a cold winter evening. That was the dry variety. The dish I am talking about today is the fresh variety. "Khadra" in the name means green, to indicate freshness rather than colour. To prepare this dish you need to mix your ingredients and let the flavours develop over three days. As you can imagine it is lots of hassle for a tiny Mezze dish. I usually prepare a large patch, divide it into portions and freeze it. When I get it out of the freezer I freshen it with a spoon of yogurt then add my fresh ingredients. To make your keshkeh you need to mix the Bulgar and the yogurt in a bowl. Start with 1 bulgar to 2 yogurt ratio. You will need to add more yogurt later and you will likely end up with 1:3. Cover and leave in a cool place overnight. Mix well in the morning and add more yogurt as the bulgar would have absorbed all the moisture. Cover and put in the fridge. Every twelve hours or so you need to mix, add a bit more yogurt, cover and return to the fridge. You need to repeat this for about three days till the flavour develop. The final consistency need to be similar to Mutabal (thinner than Hummus). When your keshkeh mixture is ready, take a portion size. Mix with 1 table spoon fine chopped onion, 1 table spoon chopped parsley and 1 table spoon crushed walnuts. The flavour is very delicate so go easy on the salt or don't use any even. Spread on a plate. Drizzle some olive oil and enjoy. I'll definitely be trying this one! Although I'm all things Damascus, in heart, kidneys and soul, my originally southern genes pop up and speak for themselves when it comes down to "kishk", mansaf with real "ketha" and similar dishes from the south. What is "ketha"? I can't figure out the Arabic word. If you have a recipe of Mansaf please send it to me. I've never tried Mansaf, belive it or not. Keta is actually dried yogurt, although I think it's first treated some way or another. Btw, the mansaf I'm talking about is not the Jordanian kind. It's the typical horani dish also called "karme" or "mlehi", with burgul, meat, kibbe, etc. I tried the Horani Mlehi once before. My best friend aunt invited us to their town in Horan and the food was yummy. Nevertheless, when you get the recipe send it to me. Thank you very much Rebecca. Keep coming back and you will see more and more of our cuisine. Your blog is fab, by the way. Just now getting caught up with your blog. Thank you so much! I'm really looking forward to trying all these things. And I've been wondering what keshk was--thanks! Welcome to my blog. I am so glad you are here, I love your blog. Truly good. fabulous recipes. I had a mint and lime drink in Aleppo - does anyone have the recipe? Welcome to my blog. I was about to put a recipe for the lemon and mint drink but I thought I will wait till the summer when it is most appropriate. It is actually very simple, lemonade and mint in a blender. Make lemonade the way you like it with lemon, water, sugar and very little lemon zest. Once you are happy with the lemonade, add mint leaves (around 10-15 per glass) and blend till the mint leaves are very finely chopped. I came across your wonderful post when I had four-day-old 'keshk' sitting in my kitchen, my first try making it after coming across the recipe in a rather strange cookbook that is specifically about fermented foods (sauerkraut, kefir, that sort of thing). I was searching the web for some way to find the original/authentic version to check it against. I have to say, as a New Englander in the United States I was hesitant to taste - but it was incredible. Like a really good cheese, the aroma while the stuff is aging is nothing like the taste. I have a feeling I'm going to be inflicting this one on unsuspecting guests and potlucks for some time to come. Thanks so much for your marvelous blog - I look forward to trying other recipes! Welcome to my blog and sorry for the late reply. I was out of the country. That sounds like a very interesting book you have. What is it called? I am so glad you liked the Keshkeh. It is fairly unkown dish. Even when you find a recipe on the net it is almost always a quick version made by mixing labneh and Burgul wheat. Mixed together and ready to go in 5 minutes. Although it is nice, it is no where as good as the slowly matured version. Welcome to my blog again and keep coming for new ideas. Thanks for this recipe. Like the last poster, I have a book with the keshk recipe (Wild Fermentation by Sandor Katz)but couldn't figure out if it was the same as the dried yogurt my uses for mansef (Palestinian version) or something else. I'm going to try your recipe here! Sounds divine. And loving your blog overall. Welcome to my blog. Keshk is different from the dry yoghurt you use in mansaf. That one is called Ketha (keta or qetha...) and it is salted sundried yoghurt. what bulgar grade do you use for this dish? We have here 4 diferent grades starting with number 1 the finest to number 4. Where is that!!! here in England you will be lucky to find even two! I would go for a 2 or 3 depending how do you prefer the final texture. I live in NJ in the US and we have it available in the arabic stores. Anyway, I started the process with number 1 because I couldn't wait to try the recipie and I had only number 1 bulgar. I have been trying a lot of your recipies they are great. Thank you very much for all your effort. Thanks for the nice words. I am glad you like the recipes. I hope you will likt the Keshkeh as well. mansaf is the jordanian equivalent of shaqriyeh from syria...spiced lamb stewed in yogurt..
My grandma was the best Syrian cook I ever knew but this blog, I like! Thank you! Welcome to my blog. Glad you like it! I think that this is wonderful, I want to visit this restaurant because I love the good food, excellent post , thanks for sharing ! looking for I don't even remember what, I came across your blog, and I cannot stop marveling! My husband is a very proud halabi who has been bragging day in and day out about their cuisine ever since we got married. I am a good cook and a devoted wife, so I have managed most of the dishes he describes not bad (with vegetarian adaptations on top of it), but some of them seemed nearly unheard of, to the point that I started thinking he was inventing! But here they all are, in your excellent blog... Given the permanent no access verdict to his halabi family's kitchen in Syria imposed on me (complex circumstances), your blog is probably the next best thing available for me. Alf Shukr!!! Thank you for your comment and apologies for the very late reply. I hardly check the blog or the email account these days. I am delighted you like the blog and you found all the recipes you were looking for. Hope you keep cooking and please send me any feedback. Ice cream van!!!! what a great idea! 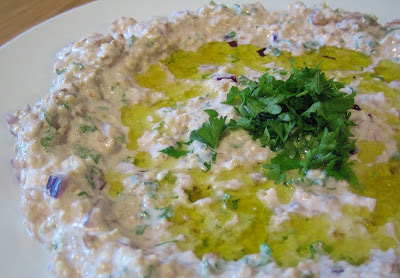 Mutabal and Baba Ghanoush: Which is Which?